The other day, at the office, I had a crazy busy morning. I was in meetings, on calls, and rushing to and from commitments until the afternoon. After eating lunch, my whole body felt heavy. I wasn’t as active as I was in the morning, so sitting at my desk doing some head-down work was making me sleepy. I felt so sluggish that I desperately wanted to take a nap and come back refreshed. Instead, I employed a few mental-fog clearing tactics which snapped me out of my slump. We have all been there – after lunch, we get tired and we still have work to do at the office. Nap time would be ideal, but since we are no longer in kindergarten, it’s just not realistic. Plus, your boss probably doesn’t want to see you sleeping under your desk. It’s normal to feel tired after lunch, and rarely are people at their best in the afternoon, but there are some things you can do to stay awake and get the work you need to do done! If it’s before 3 PM, caffeine is the easy way out. 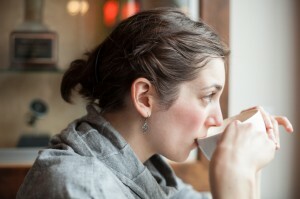 You can always drink a cup of coffee or some green tea to kick start your brain again. Caffeine makes you more mentally alert, which can be very helpful, but make sure not to drink too much before bed. Often, people become tired because they are not hydrated. Drinking a glass of water or two (I personally drink a liter after lunch and a liter before) will help your brain start working again. Very few people drink enough water throughout their day to begin with, so you probably need to be drinking more in general. Our brains often go to sleep after lunch because the food you just ate is being digested, and most likely you’ve been sitting at your desk all morning. Get up, get moving, and be active. This will help the blood flow you your brain, and you will feel far more alert because of it. Even if it is just walking to the bathroom and back or to the photocopier, you’ll find it much easier to stay awake if you avoid being parked at your desk the entire afternoon. The effect of breathing is under-rated. Most people don’t give the simple act of breathing enough credit, but if you take deep breaths, and let them out slowly, the oxygen will go to your brain, and help your organs function more efficiently. Practice different breathing techniques. This will help circulate the blood through your body, and clear the mental fog that often happens after lunch. Listen to something energizing. Often, music will snap you out of whatever fog you are in and put a bit of energy back into your day. It’s very powerful – think about how people listen to music when they are working out, and it seems to give us a bit more energy. Find your favorite song and put it on to pump you back up. I would much rather be awake, productive and alert all day, and these things have helped me snap out of it. This has been my week! I’ll definitely have to apply some of these tips going forward! Definitely do – you’ll see a huge benefit! I personally don’t do well with office work for this exact reason. When I was a Construction Project Manager, I never got sleepy because I was constantly moving around the job site and regularly being exposed to fresh air, sunshine and a lot of temperature swings. Then I become a Program Manager and was stuck in an office building all day with stale air, constant temperature control, little access to natural light, and too much sitting. I did that for 3 years and could just never get used to an office desk job. I loved working outdoors when I did do that – it was a great feeling. Love this!! I always fall victim to the afternoon slump. I normally have a cup of iced coffee around 2:00 and try to get out and exercise. If I can’t get out, I do a few jumping jacks and push-ups, turn on some music and I’m good to go! Getting the blood flowing is certainly very helpful. Good luck! I hate that when it happens. I always feel its my age and how embarrassing but I guess it happens to everyone. I always get up and move! Honestly, I just go somewhere and take a nape for 20 minutes. Can’t fight the sleeps! Feel great after too.